Goods require money to finance both their production as well as their movements. They need oil and energy for the same reasons. If oil and money markets were drastically awful for a few months before December, and then purely chaotic during December, Mario Draghi of all people should’ve been paying attention. China put up some bad trade numbers for last month, but Europe’s goods downturn came first. 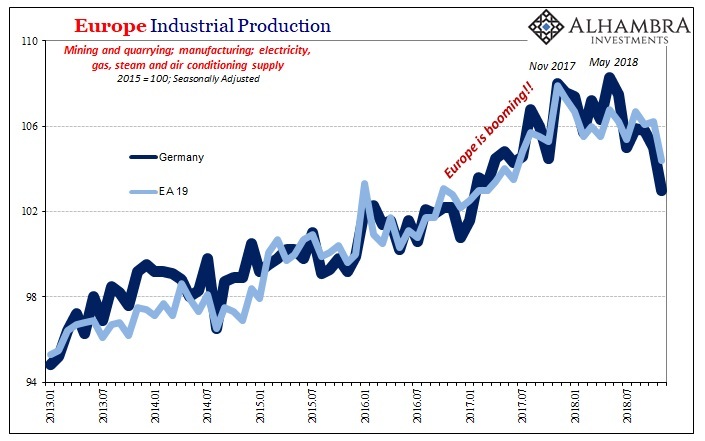 According to Eurostat, Industrial Production across the Continent declined by an alarming 3.2% year-over-year in November 2018. The minus sign was expected, especially when considering what DeStatis reported for IP in Germany last week. And though the Germans may be leading the decline, this latest update shows just how widespread the downturn has already become. You just don’t see 3% drops out of European IP. The occasional small minus may be expected here and there, but when you get to 3% and worse it’s of a scale that dramatically reduces the number of realistic interpretations. 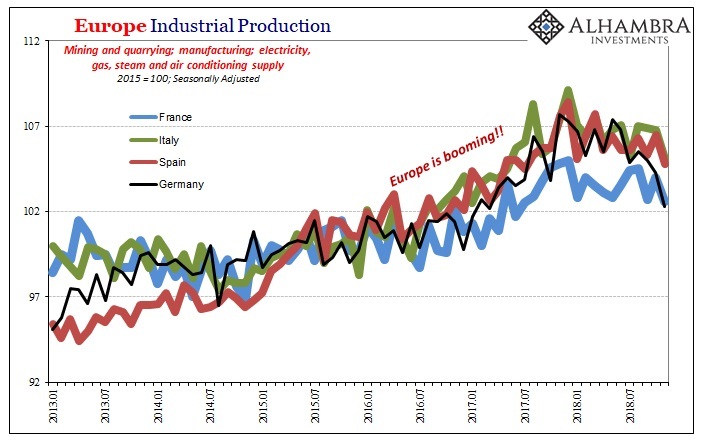 The last time European industry was falling at this rate was the last time all of Europe was in recession (2012-13). Where Mario Draghi comes into it is how this isn’t a new development, only the speed of contraction is. 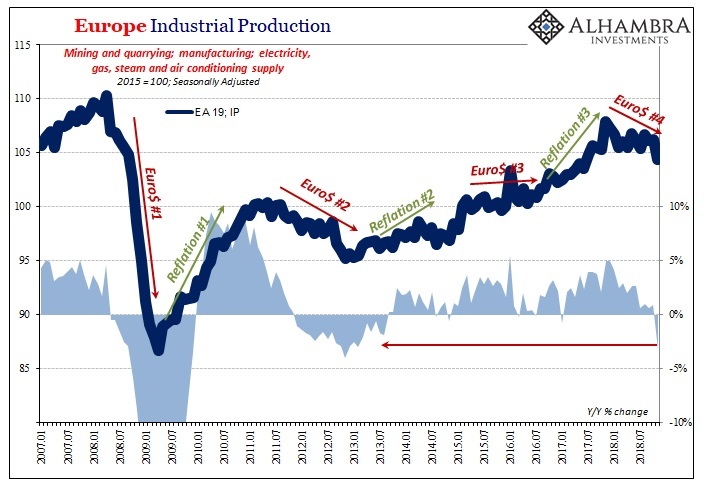 The European economy has been slowing all year, dating back to the last few months of 2017 (when eurodollar irregularity really kicked up). Every one of the ECB’s policymakers has been trying to downplay and dismiss the deceleration all throughout. They’ve even gone so far as to terminate their PSPP asset purchase (also called QE) in an intentional display of confidence. The reason? This is all just transitory stuff, nothing to get too worked up over. A small retrenchment from a rapidly booming economy isn’t necessarily a bad thing, Draghi has said. It is consistent, however, with what happened to global markets in December. The real economy is at the center of a lot of them, and if there was rapidly spreading fear throughout, which there was, the basis for it wasn’t just future concerns way out over the visible time horizon. This is happening now, and you can see that view in things like the eurodollar futures curve which inverted so substantially as to price a non-trivial probability for a near-term rate cut from the Fed. We find ourselves, I think, in the middle; markets have been somewhat soothed since by the “Fed pause”, what seems to be a more cautious ECB, and a more active PBOC/Communist government. At the same time, though, everyone is waiting for the next shoe to potentially drop. 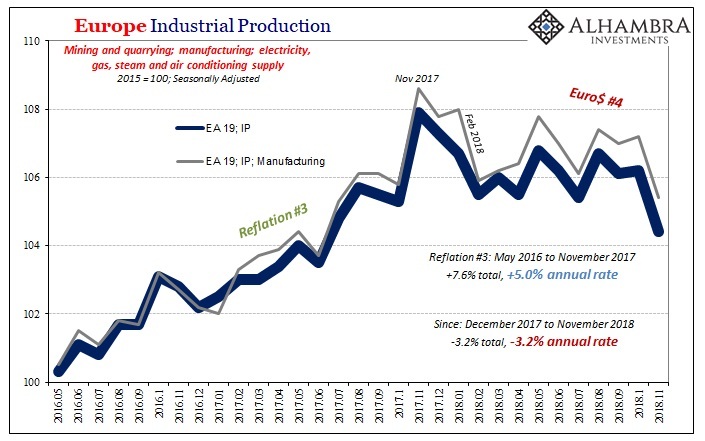 We don’t yet know what European IP was in December 2018, but it could be even worse than November (if China’s figures are anything to go by). And what happens if or when the minuses begin to spread to the US? The bigger the minus the less likely this is all just a remarkable footnote on the way to normalcy. You can dismiss Argentina or Brazil as basket cases, you can even go so far as to make Germany’s sudden decline about something else. If Europe and China are going down together? Even Esther George quickly changes her tune. This is what the flattening, 3% US$ curves have been saying about the global economy for years; poised to sour, not soar.